Established over 80 years ago, Sherborne has grown from a small family business into one of the most successful upholstery companies in the United Kingdom. Established as a Limited Company in 1953, the Sherborne name, with its distinctive label, can now been seen on the most comprehensive selection of upholstery styles, ranging from the ultimate in relaxing Leather Recliner Chairs to traditional Fireside Chairs and Adjustable Beds. 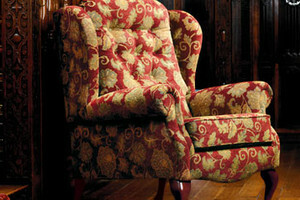 Traditional craftsmanship is combined with the latest in sophisticated manufacturing techniques to ensure that every Sherborne Recliner Chair, Fireside Chair and Adjustable Bed is produced to a consistently high standard. 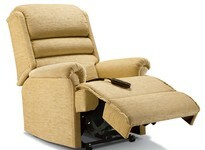 Recliner Chairs can be selected as Manual Recliners, Powered Recliners or Electric 'Lift & Rise' Recliners. Four of our most popular Recliners can now be ordered in a choice of four different sizes to enable you to find the perfect fit – Petite, Small, Standard and Royale. All Sherborne Leather Recliner Chairs and Leather Fireside Chairs are made entirely out of full genuine hides for extra durability. With the addition of the Elegance Range of upmarket, co-ordinating fabrics in 2012 there are now four full pattern books to choose from across every single model in the range. Manual and Powered Recliners use the same, super smooth action which enables a seemingly infinite number of recline positions to be reached with only the slightest of bodyweight movements or through the handset. With all the benefits of a Manual Recliner, Powered Recliners have the added flexibility of a handset control or a two-button switch on the outside arm. Both these options come with the reassurance of rechargeable versions so there's no need to leave a cable running from the base of the Recliner to the wall socket. For those who have difficulty getting in and out of conventional furniture, a Lift & Rise Recliner can make a huge difference to quality of life. 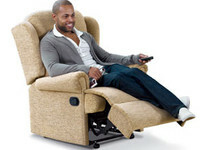 Electric 'Lift & Rise' Care Recliners come in a choice of Single Motor or Dual Motor control. Electric Recliners are designed with Full Powerlift Facility to Assist Sufferers of arthritis, rheumatism, MS, poor circulation and many other mobility restrictions. In 2013, Sherborne started to manufacture adjustable beds. Its Dorchester Adjustable Bed is available in five sizes from 2'6" to 6' and with a choice of four Mattresses and two Headboards, with dual motor control as standard. Every Sherborne Manual, Powered and Lift & Rise Recliner and Adjustable Bed comes with a Personal 5 YEAR GUARANTEE on actions, frames, electric motors and all remaining electrical parts. This guarantee covers all defects in workmanship and materials providing the furniture has been used in the correct way. If a Recliner Chair or Adjustable Bed has been recommended to you or a family member for health reasons, and you live in Northern Ireland, request a letter from your Doctor and we’ll Zero Rate the Vat on your purchase! Yes, you will not need to pay the 20% VAT! For those that prefer a traditional styled recliner the Sherborne 061 Lynton Standard Manual Recliner is a stylish standard recliner also available in small and royale sizes. With its attractive scroll arms, this recliner has a fibre-filled back cushion complemented by a soft and comfortable chaise seat and comes with a handle release catch. Or for a more contemporary feel, the Sherborne 030 Keswick Royale Leather Powered Recliner is a modern and stylish large recliner also available in small and standard sizes. Designed for exceptional comfort, with soft, stylish arms, this leather recliner has a fibre-filled back cushion and full-width chaise seating. The Sherborne 7442 Comfi-sit Royale Dual Motor Lift & Rise Recliner is a luxuriously comfortable, and Popular Electric Recliner featuring Full Chaise Seating and a Soft, Comfortable Back Design. 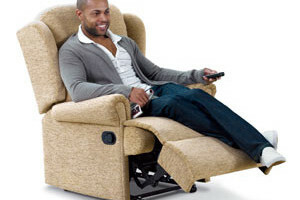 With single-use Emergency Back-up fitted as standard, and Multi-use Battery Back-up available at extra cost, this luxurious Lift & Rise Recliner is supplied with Castors for ease of movement, or Glides for use on solid flooring. Sherborne, the leading British manufacturer of Electric 'Lift & Rise' Recliners, has now developed its first range of Electric Adjustable Beds. The Sherborne Dorchester 6’ Adjustable Bed is available with Two Different Mattress Options - in a choice of medium or firm – with both benefiting from a Cool Max Cover to prevent overheating. Sherborne's adjustable beds also benefit from dual motor control offering independent adjustment for the upper and lower body to enable the optimum positions to be reached for both sleeping and relaxing. At Dalzells of Markethill we have a large selection of Sherborne Recliner Chairs and Beds in a range of sizes and finishes, with each benefiting from a personal 5 year guarantee. 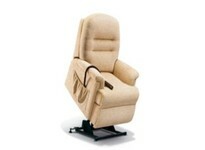 From Powered Leather Recliner Chairs through to Soft Fabric Lift and Rise Recliners you'll be spoilt for choice. No time to visit in-store? No problem. You can browse from the comfort of your home via our website ArmaghBeds.com where you'll find the full suite of Sherborne Manual, Powered and Lift & Rise Recliner Chairs, not forgetting Sherborne's excellent range of Adjustable Beds. What's more, if a Lift & Rise Recliner Chair or Adjustable Bed has been recommended to you or a family member for health reasons by a medical professional, and you live in Northern Ireland, request a letter from your Doctor and we’ll Zero Rate The Vat on your purchase! Yes, you will not need to pay the 20% VAT! If you live in the rest of Ireland and you're in the market for a new upholstered or leather Adjustable Chair or indeed an Adjustable Bed, don't worry, as we love to strike a deal. And with Free Delivery throughout our Free Delivery Zone - Northern Ireland and Counties Monaghan, Louth and Dublin - there's never been a better time to invest in new Sherborne furniture!